Meet the adorable Spectacled Owl. We did! Our very White Christmas was spent in Utah with my brother (the same brother who inspired Pet-Friendly Francie). The amazing Tracy Aviary www.TracyAviary.org in Salt Lake City. Happily, they were celebrating the opening of their newest exhibit – Treasures of the Rainforest. Despite the snow outside, we stepped into a lush, toasty warm sanctuary, filled with beautiful birds from the Tropics. 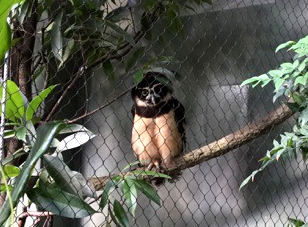 This Spectacled Owl, and her mate, really caught our attention. Talk about personalities! She kept cooing at us while her handsome beau head-bobbed. They seemed just as curious about us, as we were gazing at their black and pumpkin-orange feathers and bright glowing eyes. I highly recommend a visit to Tracy Aviary whenever you’re in Salt Lake City. It’s full of feathered treasures!